Something ate this nine-foot great white shark... But What? The film crew tags a number of great white sharks to study their movement patterns along Australia's coast. A tagged nine-foot (2.7m) great white shark whose electronic tag washed up on a beach. When scientists checked the data, they discovered a terrifying sequence of events: the tag had been dragged 1,900 feet (580m) below the surface, then eaten achieving a 78F temperature, 32F higher than a great white sharks normal body temperature. 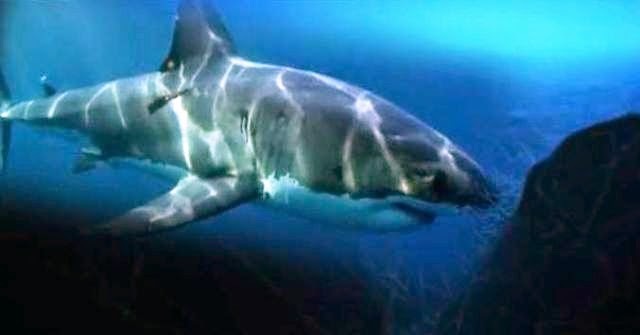 So this raises a reasonable question: what could possibly eat a nine-foot great white shark? ...or the tag came detached and was swallowed by something smaller?